MAY, 2011 – John Boriack, friend and client, just returned from a two week mission, where he and his friends visited a small remote Christian orphanage called Casa Hogar Canaan in Chiapas, Mexico. This orphanage was started by a Christian family who crossed paths with homeless children and gave them a home, their home. Through Global Sports Foundation and your generous donations, John distributed clothing and soccer equipment. And for the first time, they now play baseball! 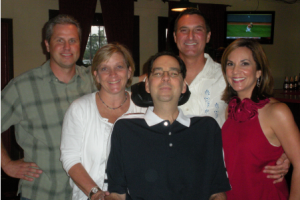 With deep sadness and regret I inform you our recipient last year, Bobby Vincent, passed away from complications from ALS (Lou Gehrig’s Disease) Sunday morning, January 30, 2011. I had the pleasure of meeting with Bobby and his family at their home and further communication via email and text in later months. Bobby was a great guy with a witty humor. He was extremely thankful for everything all of you had done for him through the marathon game efforts.